Many companies are looking for ways to cut cost in their marketing departments. A solution to this is integrating social media into their campaigns. Using websites such as Facebook is effective at generating engagement and is inexpensive. NARS cosmetics were confronted with the problem of launching a new product with out a large budget. 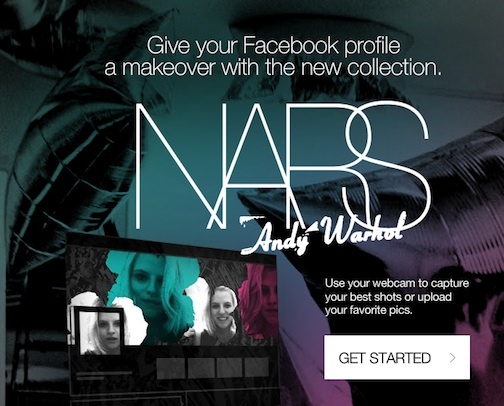 NARS took this challenge and created a marketing campaign using social media without any free giveaways. The purpose of the campaign was to launch the Andy Warhol-inspired make up collection. The campaign created Andy Warhol inspired cover and profile pictures on Facebook. These pictures were altered by using colors from the new make up line. People could give their Facebook a “makeover” by uploading pictures and then selecting colors inspired by the new products. The goal of the campaign was to create buzz by appearing on people’s newsfeed. NARS decided to not use paid advertisement. Unfortunately, not many people created images. In totally their were 3,143 users. Each users spent about seven minutes and nine seconds on the website. However, this generated 823,000 impressions on Facebook. Although the campaign did not have many participants, it created engagement and increased buzz about the product. The campaign caught the attention of many beauty and tech blogs, which discussed NARS approach on the launching of their new product line. The campaign was successful because it generated buzz, even though it did not have many users. The article discusses how the campaign could have been more successful if they had used paid advertisements. I disagree, friends who find a brand organically are 75% more likely to visit their fan page. I believe a buzz for the brand was created because NARS didn’t use paid advertisement and the whole campaign was done viral. I really like this story and article! I think not having a large budget is a problem a lot of organizations have, especially smaller and medium-sized businesses. NARS idea was a good one; it was fairly creative and unique, which may explain some of the viral nature of the campaign. Some paid advertising could have helped and by setting limits, NARS wouldn’t have had to break the budget. Companies like NARS should take advantage of the inexpensiveness of social media because it is somewhat like outsourcing a marketing department. NARS could have also performed some search engine optimization, which also may have increased impressions for the social media and regular site. Good post! This is really interesting, thanks for writing about it! I love the cosmetic industry and find it fascinating how each company chooses to release and promote their brand. I feel that even though NARS wasn’t interested in paying for ads, they could have approached bloggers, like Temptalia, or gone to Sephora to advertise it. I feel that if NARS has chosen not to let this be super organic but put a bit more attention into it, it could have been a very popular and talked about campaign.